MDF Ash Veneer with Almond Velvet Interior. Smooth Matte Finish. Swing bar handles, adjustable bed, and mattress matching pillow. Solid Poplar in Rich Glossy Finish. White Crepe Interior. All wood green design, eco friendly. Solid Poplar in Lite Maple Color Satin Finish. White Crepe Interior. All wood green design, eco friendly. Solid Poplar in Rich Satin Finish. White Crepe Interior. All wood green design, eco friendly. Solid Poplar with Antique Gold Pieta corners and Almond Velvet Interior. High-Gloss Finish. Swing bar handles, adjustable bed, and mattress matching pillow. Solid Poplar in Rich Glossy Finish. White Crepe Interior. All wood green design, eco friendly. Premium Solid Walnut with White Velvet Interior. Smooth Satin Finish. Swing bar handles, adjustable bed, and mattress matching pillow. Premium Solid Oak with Almond Velvet Interior. Natural Matte Finish. Swing bar handles, adjustable bed, and mattress matching pillow. Premium Solid Mahogany Wood with Almond Velvet Interior. Rich Glossy Finish. Swing bar handles, adjustable bed, and mattress matching pillow. Premium Solid Cherry Wood with White Velvet Interior. Rich Glossy Finish. Swing bar handles, adjustable bed, and mattress matching pillow. 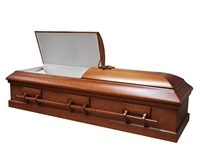 Divine Caskets offers a wide series of premium wooden caskets and coffins. Choose from various styles, from mahogany caskets, to walnut, to premium cherry selections in a matte or glossy finish. With elegant curves and a luxurious interior, these wood caskets or wood coffins will ensure a dignified presentation at a wake or funeral. All of our solid wood caskets have been hand-selected by our team and have strong construction to protect your loved one while also offering an elegant lined interior and other comforts. From ornate styles like the Elite Cherry Casket to simple wooden caskets like the Shalom Casket, there is a model for every taste and every price point. If you are not seeing any wood caskets or wood coffins that fit your loved one’s personality, or if you’re trying to decide between wood vs metal caskets or coffins, visit our line of steel caskets as well. We are dedicated to ensuring that your experience is as pleasant as possible. If you still have questions about how to buy a funeral casket or coffin online, call us toll free or head to our Frequently Asked Questions page.